Casinos in the resort are becoming taller, roomier, and much costlier to build. The Hilton hopes to expand to keep pace. ATLANTIC CITY - Size matters in this seaside gambling mecca. With at least four $1 billion gambling behemoths to be built in the next five years, the resort's smallest casino - the Atlantic City Hilton - has plans for a $1 billion expansion to more than double its size so it can compete in a market that has taken on a much larger scale. 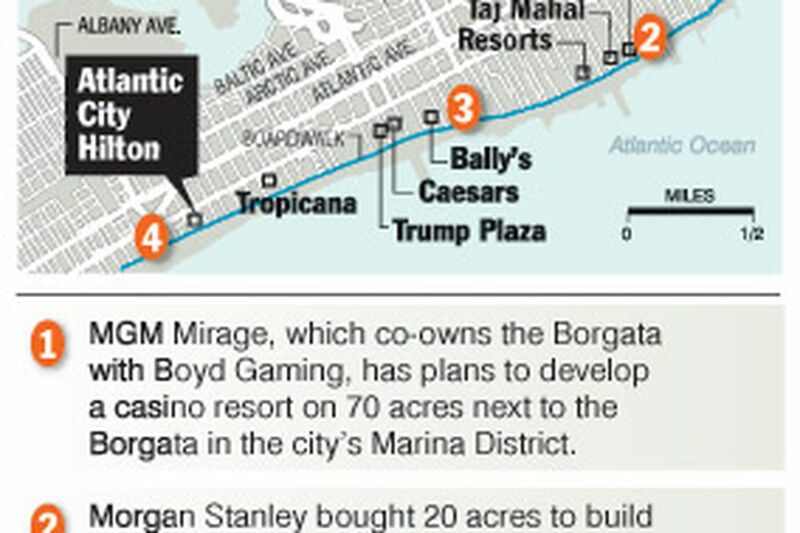 "It will be a Borgata-like property," said Tony Rodio, president of the Atlantic City Hilton and Resorts casinos, referring to the golden-hued, Las Vegas-style mega-facility that redefined Atlantic City and became its top-grossing casino. "The Atlantic City Hilton is a wonderful little property that's just too small to compete with the big guys." Rodio presented the plan to executives of Colony Capital L.L.C., which owns the Atlantic City Hilton's parent company, Resorts International Holdings Inc., late yesterday in Las Vegas. "The meeting went well, and Colony is evaluating the project," Rodio said last night. The Hilton owns land - along Pacific Avenue to Atlantic Avenue, and from Boston Avenue to two blocks north, heading toward the Tropicana Casino Resort - that could be used for expansion. The casino floor would double, to about 120,000 square feet. Hilton also plans to add a 1,000-room hotel, restaurants, shops, a theater, and a 3,000-space parking garage. The plan reflects the new climate in Atlantic City, where being small and outdated, like the former Sands Hotel Casino, can mean extinction. The Sands closed in November after it was bought by Pinnacle Entertainment Inc. of Las Vegas, which plans to build a much more substantial, $1.5 billion facility. The Hilton was built by casino mogul Steve Wynn and opened as the Golden Nugget in 1980. Wynn sold it in 1987, and it was renamed the Atlantic City Hilton. Rodio said the nearly 27-year-old casino had been constrained by its size and routinely had to turn hotel customers away. It last expanded a decade ago, when 300 hotel rooms were added. The Hilton's 804 hotel rooms are the fewest among Atlantic City's 11 casinos, but its 96.4 percent occupancy rate was the highest. "We have to turn away between 30,000 to 35,000 people a month who want to stay with us because there's nowhere to put them," Rodio said. Gross operating profits at the Hilton increased 79 percent last year to $51.8 million. But with the advent of slots competition in Pennsylvania in November, the restraints of the Hilton's size were beginning to show. Slot-machine revenue was down 6 percent, table-games revenue fell 10.2 percent, and total revenue decreased 7.4 percent last month compared with a year earlier, according to figures from the New Jersey Casino Control Commission. The Hilton plans to add a 1,000-room hotel tower; 60,000 square feet of gambling-floor space; shops; restaurants; a 3,500-seat multipurpose room that will serve as a ballroom, convention and meeting space; and an events center for shows and concerts. Rodio first revealed the expansion plans last Wednesday at a relicensing hearing for the Hilton before the New Jersey Casino Control Commission. The timing may be in the Hilton's favor. This month, Colony announced that one of its casinos - Resorts East Chicago - was being sold to Ameristar Casinos Inc. of Las Vegas for $675 million, some of which could help finance the Hilton's expansion. Rodio knows he has to move fast. At least four casinos, owned by Morgan Stanley, Pinnacle, MGM Mirage and a private investor group from Atlantic City, are expected to open here by 2012 - putting intense pressure on small casinos to expand their business. One of the new operators - Revel Entertainment Group, L.L.C. - announced yesterday that it had selected Tishman Construction Corp. to build its $1 billion-plus casino on 20 acres on the northern end of the Boardwalk. The owner of that site is Morgan Stanley, the investment-banking firm. The existing competition also has been expanding. The Borgata Hotel Casino & Spa, Harrah's Marina and the Trump Taj Mahal casinos are adding hotel towers. The Tropicana is negotiating to add a boutique hotel next to its property. Plans for a new hotel at the Hilton have been discussed since Wallace Barr was head of Caesars Entertainment Inc., which formerly owned the Hilton. The hotel was sold to Colony in late 2004 when Harrah's Entertainment Inc. was acquiring Caesars Entertainment. "It's a great idea. They have a tremendous amount of land to work with," said Barr, who at the time negotiated the land deal for the proposed Hilton expansion. "It can't continue to exist as the smallest casino in Atlantic City." Barr reemerged from retirement last spring as part of a local investor group that wants to build a $1 billion casino next to the Hilton. A 30-year veteran of the gambling industry, Barr said the days of building $500 million casinos with 375-foot-high hotels and 500 rooms were long gone. Building-height restrictions in Atlantic City were eased after Bader Field closed in 2006, permitting towers of up to 800 feet that can hold 2,000 to 3,000 rooms. He also said $1 billion was now the minimum to build a casino in the city. "The last thing we want to do is build a Bally's or a Trump Plaza from the 1970s and 1980s that will clearly not be competitive," Barr said of his proposed casino. "You have to build for what Atlantic City is today and let the rest of the world catch up."